Galileo was an unmanned spacecraft sent by NASA to study the planet Jupiter and its moons. Named after the astronomer and Renaissance pioneer Galileo Galilei, it was launched on October 18, 1989 by the Space Shuttle Atlantis on the STS-34 mission. It arrived at Jupiter on December 7, 1995, a little more than six years later, via gravitational assist flybys of Venus and Earth. Despite antenna problems, Galileo conducted the first asteroid flyby, discovered the first asteroid moon, was the first spacecraft to orbit Jupiter, and launched the first probe into Jupiter's atmosphere. On September 21, 2003, after 14 years in space and 8 years of service in the Jovian system, Galileo's mission was terminated by sending the orbiter into Jupiter's atmosphere at a speed of nearly 50 kilometres per second to avoid any chance of it contaminating local moons with bacteria from Earth. 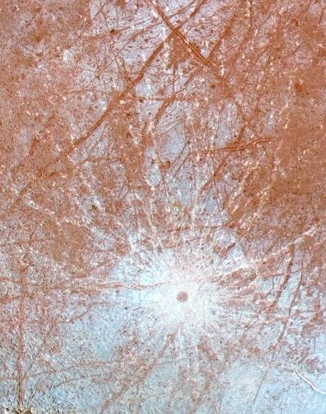 Of particular concern was the ice-crusted moon Europa, which, thanks to Galileo, scientists now suspect harbors a salt water ocean beneath its surface. Galileo's launch had been significantly delayed by the hiatus in Space Shuttle launches that occurred after the Challenger space shuttle disaster. New safety protocols introduced as a result of the Challenger accident forced Galileo to use a lower-powered upper stage booster rocket, instead of a Centaur booster rocket, to send it from Earth orbit to Jupiter. Several gravitational slingshots, called a "VEEGA" or Venus Earth Earth Gravity Assist maneuver, provided the additional velocity required to reach its destination: Venus was flown by on February 10, 1990, and Earth twice, on December 8, 1990, and again on December 8, 1992. Along the way Galileo performed close observation of the asteroids 951 Gaspra (October 29, 1991) and 243 Ida (August 28, 1993), and discovered Ida's moon Dactyl. In 1994 Galileo was perfectly positioned to watch the fragments of comet Shoemaker-Levy 9 crash into Jupiter. Terrestrial telescopes had to wait to see the impact sites as they rotated into view. Galileo's prime mission was a two-year study of the Jovian system. The spacecraft traveled around Jupiter in elongated ellipses, each orbit lasting about two months. The differing distances from Jupiter afforded by these orbits allowed Galileo to sample different parts of the planet's extensive magnetosphere. The orbits were designed for close up flybys of Jupiter's largest moons. 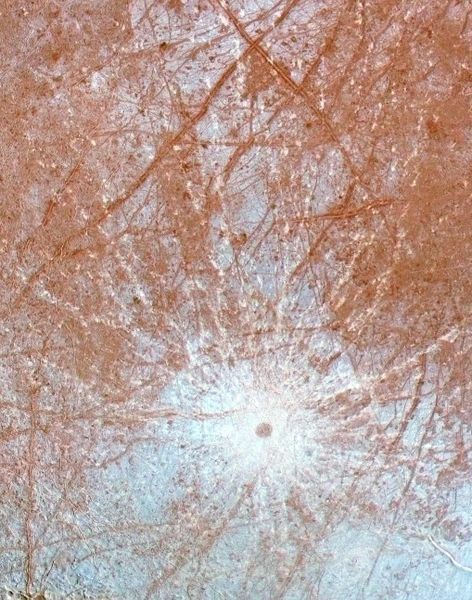 Once Galileo's prime mission was concluded, an extended mission followed starting on December 7, 1997; the spacecraft made a number of daring close flybys of Jupiter's moons Europa and Io. The closest approach was 180 km (112 mi) on October 15, 2001. 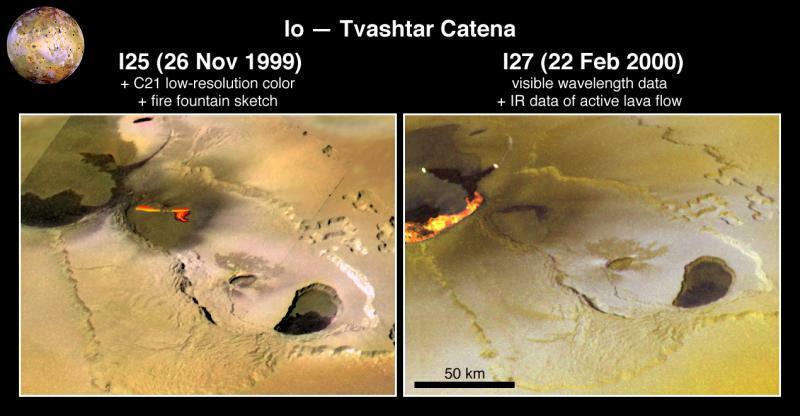 The radiation environment near Io in particular was very unhealthy for Galileo's systems, and so these flybys were saved for the extended mission when loss of the spacecraft would be more acceptable. 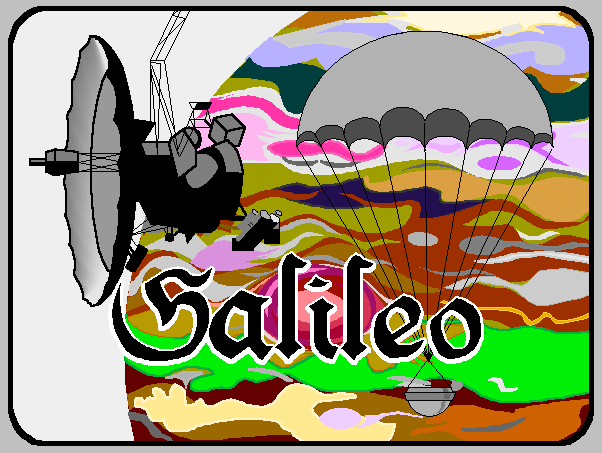 Galileo's cameras were deactivated on January 17, 2002 after they had sustained irrecoverable radiation damage. NASA engineers were able to recover the damaged tape recorder electronics, and once more Galileo continued to return other scientific data until it was deorbited in 2003 as described above, performing one last scientific experiment —a measurement of Amalthea's mass as Galileo swung by. At launch, the orbiter and probe together had a mass of 2,564 kilograms (5,653 pounds) and was seven metres tall. One section of the spacecraft rotated at 3 rpm, keeping Galileo stable and holding six instruments that gathered data from many different directions, including the fields and particles instruments. The other section of the spacecraft was an antenna, and data were periodically transmitted to it. Back on the ground the mission operations team used software containing 650,000 lines of programming code in the orbit sequence design process; 1,615,000 lines in the telemetry interpretation; and 550,000 lines of code in navigation. The spacecraft was controlled by a RCA 1802 Cosmac microprocessor CPU, clocked at about 1.6 MHz, and fabricated on sapphire (Silicon on Sapphire) which is a radiation-and static-hardened material ideal for spacecraft operation. This microprocessor was the first low-power CMOS processor chip, quite on a par with the 8-bit 6502 that was being built into the Apple II desktop computer at that time. Galileo's attitude control system software was written in the HAL/S programming language, also used in the Space Shuttle program. The 1802 CPU had previously been used onboard the Voyager and Viking spacecraft. The Propulsion Subsystem consisted of a 400 N main engine and twelve 10 N thrusters together with propellant, storage and pressurizing tanks, and associated plumbing. The fuel for the system was 925 kg of monomethyl hydrazine and nitrogen tetroxide. Two separate tanks held another 7 kg of helium pressurant. The Propulsion Subsystem was developed and built by Daimler Benz Aero Space AG (DASA) (formerly Messerschmitt–Bölkow–Blohm (MBB)) and provided by Germany, the major international partner in Project Galileo. Solar panels were not a practical solution for Galileo's power needs at Jupiter's distance from the Sun (it would have needed a minimum of 65 square metres (700 ft²) of solar panels); as for batteries, they would have been prohibitively massive. The solution adopted consisted of two radioisotope thermoelectric generators (RTGs). The RTGs powered the spacecraft through the radioactive decay of plutonium-238. The heat emitted by this decay was converted into electricity for the spacecraft through the solid-state Seebeck effect. This provided a reliable and long-lasting source of electricity unaffected by the cold space environment and high radiation fields such as those encountered in Jupiter's magnetosphere. Each RTG, mounted on a 5-meter long boom, carried 7.8 kilograms (17.2 lb) of Pu. Each RTG contained 18 separate heat source modules, and each module encased four pellets of plutonium dioxide, a ceramic material resistant to fracturing. The modules were designed to survive a range of hypothetical accidents: launch vehicle explosion or fire, re-entry into the atmosphere followed by land or water impact, and post-impact situations. An outer covering of graphite provided protection against the structural, thermal, and eroding environments of a potential re-entry. Additional graphite components provided impact protection, while iridium cladding of the fuel cells provided post-impact containment. The RTGs produced about 570 watts at launch. The power output initially decreased at the rate of 0.6 watts per month and was 493 watts when Galileo arrived at Jupiter. As the launch of Galileo neared, anti-nuclear groups, concerned over what they perceived as an unacceptable risk to the public's safety from Galileo's RTGs, sought a court injunction prohibiting Galileo's launch. RTGs had been used for years in planetary exploration without mishap: the Lincoln Experimental Satellites 8/9, launched by the U.S. Department of Defense, had 7% more plutonium on board than Galileo, and the two Voyager spacecraft each carried 80% as much plutonium as Galileo did. However, activists remembered the messy crash of the Soviet Union's nuclear-powered Cosmos 954 satellite in Canada in 1978, and the 1986 Challenger accident had raised public awareness of the possibility of explosive spacecraft failures. Also, no RTGs had ever been made to swing past the Earth at close range and high speed, as Galileo's Venus-Earth-Earth Gravity Assist trajectory required it to do. This created a novel mission failure modality that might plausibly have entailed total dispersal of Galileo's plutonium in the Earth's atmosphere. Scientist Carl Sagan, for example, a strong supporter of the Galileo mission, said in 1989 that "there is nothing absurd about either side of this argument." After the Challenger accident, a study considered additional shielding and eventually rejected it, in part because such a design significantly increased the overall risk of mission failure and only shifted the other risks around (for example, if a failure on orbit had occurred, additional shielding would have significantly increased the consequences of a ground impact). Scientific instruments to measure fields and particles were mounted on the spinning section of the spacecraft, together with the main antenna, power supply, the propulsion module and most of the galileo computers and control electronics. 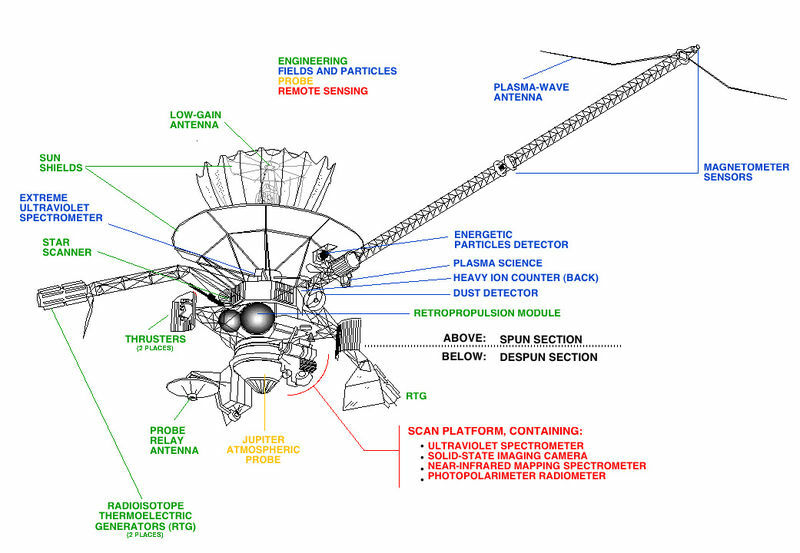 The sixteen instruments, weighing 118 kg altogether, included magnetometer sensors mounted on an 11 m boom to minimize interference from the spacecraft; a plasma instrument for detecting low energy charged particles and a plasma wave detector to study waves generated by the particles; a high energy particle detector; and a detector of cosmic and Jovian dust. It also carried the Heavy Ion Counter, an engineering experiment added to assess the potentially hazardous charged particle environments the spacecraft flew through, and an added Extreme Ultraviolet detector associated with the UV spectrometer on the scan platform. The despun section's instruments included the camera system; the near infrared mapping spectrometer to make multi-spectral images for atmospheric and moon surface chemical analysis; ultraviolet spectrometer to study gases; and photo-polarimeter radiometer to measure radiant and reflected energy. The camera system was designed to obtain images of Jupiter's satellites at resolutions from 20 to 1,000 times better than Voyager's best, because Galileo flew closer to the planet and its inner moons and because the CCD sensor in Galileo's camera was more sensitive and had a broader color detection band than the vidicons of Voyager. The SSI is an 800 by 800 pixel solid state camera consisting of an array of silicon sensors called a "charge coupled device" (CCD). The optical portion of the camera is built as a Cassegrain telescope. Light is collected by the primary mirror and directed to a smaller secondary mirror that channels it through a hole in the center of the primary mirror and onto the CCD. The CCD sensor is shielded from radiation, a particular problem within the harsh Jovian magnetosphere. The shielding is accomplished by means of a 10 mm thick layer of tantalum surrounding the CCD except where the light enters the system. An eight position filter wheel is used to obtain images at specific wavelengths. The images are then combined electronically on Earth to produce color images. The spectral response of the SSI ranges from about 0.4 to 1.1 micrometres. The SSI weighs 29.7 kilograms and consumes, on average, 15 watts of power. The NIMS instrument is sensitive from 0.7 to 5.2 micrometre wavelength IR light, overlapping the wavelength range of SSI. The telescope associated with NIMS is all reflective (uses mirrors and no lenses) with an aperture of 229 mm. The spectrometer of NIMS uses a grating to disperse the light collected by the telescope. The dispersed spectrum of light is focused on detectors of indium antimonide and silicon. The NIMS weighs 18 kilograms and uses 12 watts of power on average. The Cassegrain telescope of the UVS has a 250 mm aperture and collects light from the observation target. Both the UVS and EUV instruments use a ruled grating to disperse this light for spectral analysis. This light then passes through an exit slit into photomultiplier tubes that produce pulses or "sprays" of electrons. These electron pulses are counted, and these count numbers are the data that are sent to Earth. The UVS is mounted on the scan platform and can be pointed to an object in inertial space. The EUV is mounted on the spun section of the spacecraft. As Galileo spins, the EUV observes a narrow ribbon of space perpendicular to the spin axis. The two instruments combined weigh about 9.7 kilograms and use 5.9 watts of power. The PPR has seven radiometry bands. One of these uses no filters and observes all the radiation, both solar and thermal. Another band lets only solar radiation through. The difference between the solar- plus-thermal and the solar-only channels gives the total thermal radiation emitted. The PPR also measured in five broadband channels that span the spectral range from 17 to 110 micrometres. The radiometer provides data on the temperatures of the Jovian satellites and Jupiter's atmosphere. The design of the instrument is based on that of an instrument flown on the Pioneer Venus spacecraft. A 100 mm aperture reflecting telescope collects light, directs it to a series of filters, and, from there, measurements are performed by the detectors of the PPR. The PPR weighs 5.0 kilograms and consumes about 5 watts of power. The Dust Detector Subsystem (DDS) was used to measure the mass, electric charge, and velocity of incoming particles. The masses of dust particles that the DDS can detect go from 10 to 10 grams. The speed of these small particles can be measured over the range of 1 to 70 kilometers per second. The instrument can measure impact rates from 1 particle per 115 days (10 megaseconds) to 100 particles per second. These particles will help determine dust origin and dynamics within the magnetosphere. The DDS weighs 4.2 kilograms and uses an average of 5.4 watts of power. The energetic particles detector (EPD) is designed to measure the numbers and energies of ions and electrons whose energies exceed about 20 keV (3.2 fJ). The EPD can also measure the direction of travel of such particles and, in the case of ions, can determine their composition (whether the ion is oxygen or sulfur, for example). The EPD uses silicon solid state detectors and a time-of-flight detector system to measure changes in the energetic particle population at Jupiter as a function of position and time. These measurements will tell us how the particles get their energy and how they are transported through Jupiter's magnetosphere. The EPD weighs 10.5 kilograms and uses 10.1 watts of power on average. The HIC is really a repackaged and updated version of some parts of the flight spare of the Voyager Cosmic Ray System. The HIC detects heavy ions using stacks of single crystal silicon wafers. The HIC can measure heavy ions with energies as low as 6 MeV (1 pJ) and as high as 200 MeV (32 pJ) per nucleon. This range includes all atomic substances between carbon and nickel. The HIC and the EUV share a communications link and, therefore, must share observing time. The HIC weighs 8 kilograms and uses an average of 2.8 watts of power. The magnetometer (MAG) uses two sets of three sensors. The three sensors allow the three orthogonal components of the magnetic field section to be measured. One set is located at the end of the magnetometer boom and, in this position, is about 11 m from the spin axis of the spacecraft. The second set, designed to detect stronger fields, is 6.7 m from the spin axis. The boom is used to remove the MAG from the immediate vicinity of the spacecraft to minimize magnetic effects from the spacecraft. However, not all these effects can be eliminated by distancing the instrument. The rotation of the spacecraft is used to separate natural magnetic fields from engineering induced fields. Another source of potential error in measurement comes from bending and twisting of the long magnetometer boom. To account for these motions, a calibration coil is mounted rigidly on the spacecraft and puts out a reference magnetic field during calibrations. The magnetic field at the surface of the Earth has a strength of about 50,000 nT. At Jupiter, the outboard (11 m) set of sensors can measure magnetic field strengths in the range from ±32 to ±512 nT while the inboard (6.7 m) set is active in the range from ±512 to ±16,384 nT. The MAG experiment weighs 7 kilograms and uses 3.9 watts of power. The PLS uses seven fields of view to collect charged particles for energy and mass analysis. These fields of view cover most angles from 0 to 180 degrees, fanning out from the spin axis. The rotation of the spacecraft carries each field of view through a full circle. The PLS will measure particles in the energy range from 0.9 eV to 52 keV (0.1 aJ to 8.3 fJ). The PLS weighs 13.2 kilograms and uses an average of 10.7 watts of power. An electric dipole antenna is used to study the electric fields of plasmas, while two search coil magnetic antennas studied the magnetic fields. The electric dipole antenna is mounted at the tip of the magnetometer boom. The search coil magnetic antennas are mounted on the high-gain antenna feed. Nearly simultaneous measurements of the electric and magnetic field spectrum allowed electrostatic waves to be distinguished from electromagnetic waves. The PWS weighs 7.1 kilograms and uses an average of 9.8 watts. The 339 kilogram atmospheric probe, built by Hughes Aircraft Company at its El Segundo, California plant, measured about 1.3 meters across. Inside the heat shield, the scientific instruments were protected from ferocious heat during entry. 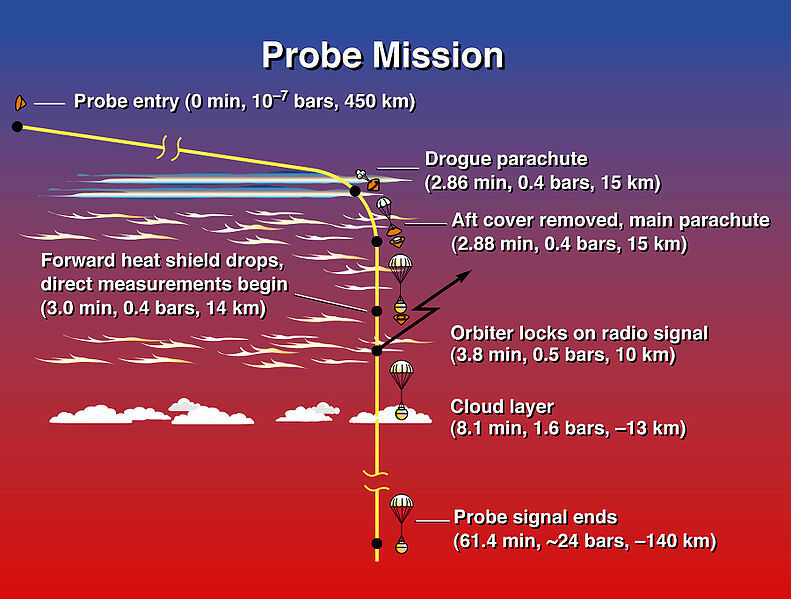 The probe had to withstand extreme heat and pressure on its high speed journey at 47.8 km/s. 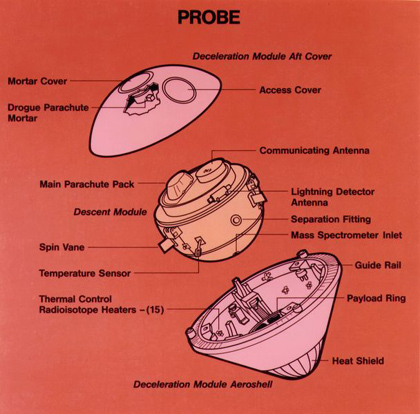 The probe was released from the main spacecraft in July 1995, five months before reaching Jupiter, and entered Jupiter's atmosphere with no braking beforehand. It was slowed from the probe's arrival speed of about 47 kilometers per second to subsonic speed in less than 2 minutes. This was by far the most difficult atmospheric entry ever attempted; the probe had to withstand 230 g'sand the probe's 152 kg heat shield made up almost half of the probe's total mass, and lost 80 kg during the entry.NASA built a special laboratory, the Giant Planet Facility to simulate the heat load, which was similar to that of an ICBM-style straight-down reentry through a thermonuclear fireball.It then deployed its 2.5-meter (8 ft) parachute, and dropped its heat shield. As the probe descended through 150 kilometers of the top layers of the atmosphere, it collected 58 minutes of data on the local weather. It only stopped transmitting when ambient pressure exceeded 23 atmospheres and temperature reached 153 °C (307 °F). The data was sent to the spacecraft overhead, then transmitted back to Earth. Each of 2 L-band transmitters operated at 128 bits per second and sent nearly identical streams of scientific data to the orbiter. All the probe's electronics were powered by lithium sulfur dioxide (LiSO2) batteries that provided a nominal power output of about 580 watts with an estimated capacity of about 21 ampere-hours on arrival at Jupiter. a lightning/radio-emission instrument with an energetic-particle detector that measured light and radio emissions associated with lightning and energetic particles in Jupiter's radiation belts. Total data returned from the probe was about 3.5 megabits. 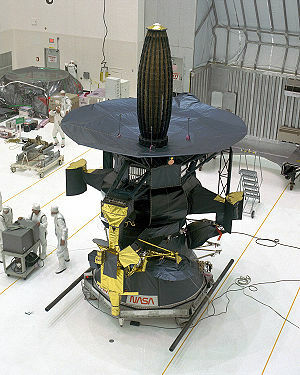 The probe stopped transmitting before the line of sight link with the orbiter was cut. The likely proximal cause of the final probe failure was overheating, which sensors indicated before signal loss. 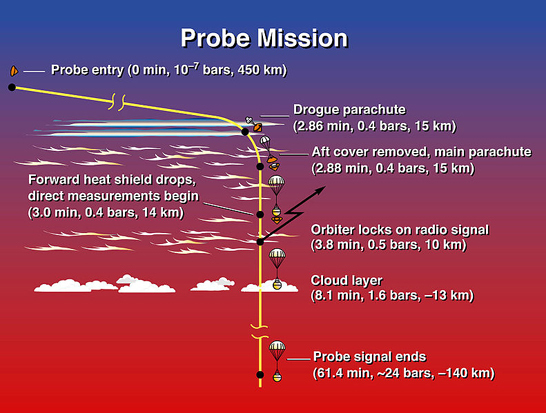 The atmosphere as the probe descended was somewhat more turbulent and hotter than expected. The probe was eventually completely destroyed as it descended further inside Jupiter. The parachute would have melted first, roughly 30 minutes later, then the aluminum components after another 40 minutes of free fall. The titanium structure would have lasted 6.5 hours more before disintegrating. Due to the high pressure, the metals of the probe would finally have vaporised once their critical temperature had been reached, completely dissolving it into Jupiter's Liquid Metallic Hydrogen interior and are probably part of the planet's solid core. Ganymede possesses its own, substantial magnetic field - the first satellite known to have one. The star scanner was a small optical telescope used to provide the spacecraft with an absolute attitude reference. It was also able to serendipitously make scientific discoveries. In the prime mission, it was found that the star scanner was able to detect high energy particles as a noise signal. These data were eventually calibrated to show the particles were predominantly > 2 MeV electrons that were trapped in the Jovian magnetic belts. A final discovery occurred during the last two orbits of the mission. 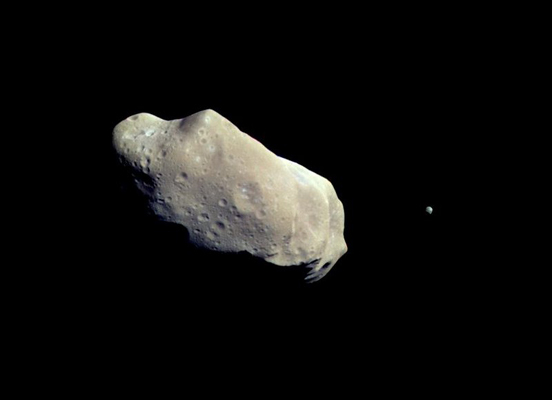 When the spacecraft passed the orbit of Jupiter's moon Amalthea, the star scanner detected unexpected flashes of light that were reflections from moonlets. None of the individual moonlets were sighted twice, hence no orbits were determined and the moonlets did not meet the International Astronomical Union requirements to receive designations. It is believed that these moonlets most likely are debris ejected from Amalthea and form a tenuous, and perhaps temporary, ring. The late Carl Sagan, pondering the question of whether life on Earth could be easily detected from space, devised a set of experiments in the late 1980s using Galileo's remote sensing instruments to determine if life indeed could be detected during the first Earth flyby of the mission in December 1990. After data acquisition and processing, Sagan et al. published a paper in Nature in 1993 detailing the results of the experiment. Galileo had found what are now referred to as the "Sagan criteria for life"; these were: strong absorption of light at the red end of the visible spectrum (especially over continents) which was caused by absorption by chlorophyll in photosynthesizing plants, absorption bands of molecular oxygen which is also a result of plant activity, infrared absorption bands caused by the ~1 micromole per mole (µmol/mol) of methane in Earth's atmosphere (a gas which must be replenished by either volcanic or biological activity) and modulated narrowband radio wave transmissions uncharacteristic of any known natural source. Galileo's experiments were thus the first ever controls in the newborn science of astrobiological remote sensing. In December 1992 during Galileo's second gravity assist flyby of Earth, another groundbreaking yet almost entirely unpublicized experiment was done using Galileo to assess the possibility of optical communication with spacecraft by detecting pulses of light from powerful lasers which were to be directly imaged by Galileo's CCD. The experiment, dubbed Galileo OPtical EXperiment or GOPEX, used two separate sites to beam laser pulses to the spacecraft, one at Table Mountain Observatory in California and the other at the Starfire Optical Range in New Mexico. The Table Mountain site used a frequency doubled Neodymium-Yttrium-Aluminium Garnet (Nd:YAG) laser operating at 532 nm with a repetition rate of ~15 to 30 Hz and a pulse power (FWHM) in the tens of megawatts range, which was coupled to a 0.6 meter Cassegrain telescope for transmission to Galileo, the Starfire range site used a similar setup with a larger transmitting telescope (1.5 m). Long exposure (~0.1 to 0.8 s) images using Galileo's 560 nm centered green filter produced images of Earth clearly showing the laser pulses even at distances of up to 6,000,000 km. Adverse weather conditions, restrictions placed on laser transmissions by the U.S. Space Defense Operations Center (SPADOC) and a pointing error caused by the scan platform acceleration on the spacecraft being slower than expected (which prevented laser detection on all frames with less than 400 ms exposure times) all contributed to the reduction of the number of successful detections of the laser transmission to 48 of the total 159 frames taken. Nonetheless, the experiment was considered a resounding success and the data acquired will likely be used in the future to design laser "downlinks" which will send large volumes of data very quickly, from spacecraft to Earth. The scheme is already being studied (as of 2004) for a data link to a future Mars orbiting spacecraft. 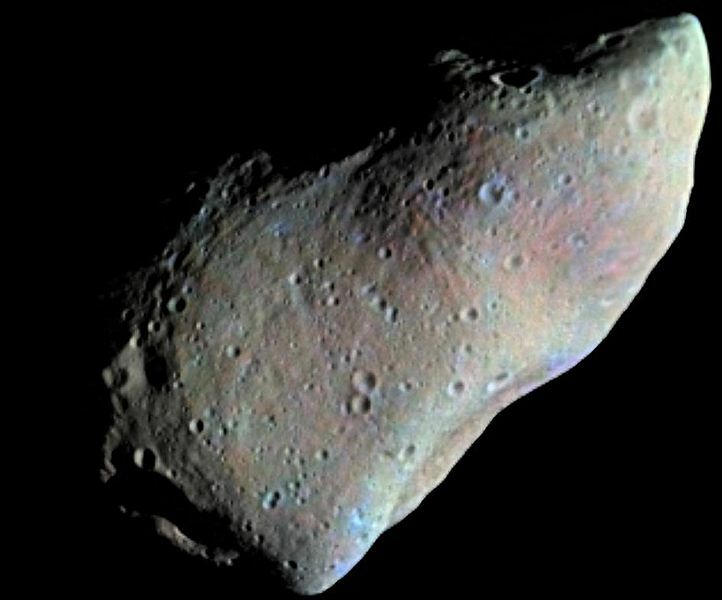 On October 29, 1991, two months after entering the asteroid belt, Galileo performed the first ever asteroid encounter by passing about 1,600 kilometers (1,000 miles) from 951 Gaspra at a relative speed of about 8 kilometers per second (18,000 mph). 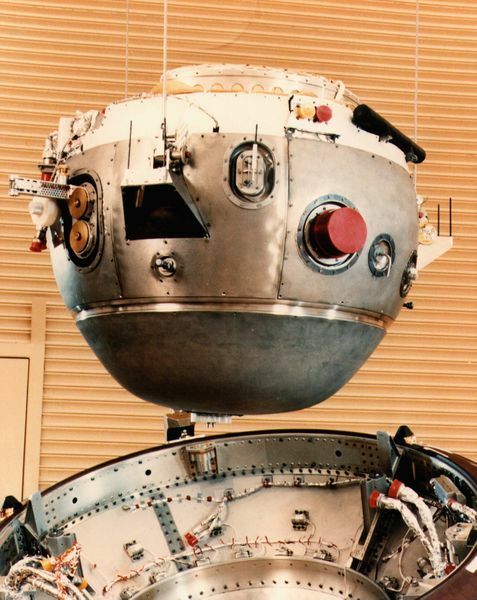 Several pictures of Gaspra were taken along with measurements using the NIMS instrument to indicate composition and physical properties. The last (and best) two images were played back to Earth in November 1991 and June 1992. The imagery revealed a cratered and very irregular body about 19 by 12 by 11 kilometers (12 by 7.5 by 7 miles). The remainder of data taken, including low resolution images of more of the surface, were transmitted in late November 1992. Twenty-two months after the Gaspra encounter, on August 28, 1993, Galileo flew within 2,400 kilometers (1,500 miles) of asteroid 243 Ida. The probe discovered that Ida had a small moon, dubbed Dactyl, only 1.4 km in diameter which was the first asteroid moon discovered. Measurements using Galileo's solid state imager, magnetometer and NIMS instrument were taken. From subsequent analysis of data, Dactyl appears to be an SII subtype S type asteroid and is spectrally different from 243 Ida. It is hypothesized that Dactyl may have been produced by partial melting within a Koronis parent body (Ida belongs to the "Koronis" family of asteroids that travels in the main Asteroid Belt between Mars and Jupiter) while the 243 Ida region escaped such igneous processing. Artist's concept of Galileo at Io. Note the fully deployed high-gain antenna. Compare with below image. For reasons which are not currently known, and in all likelihood will never be known with certainty, Galileo's high-gain antenna failed to fully deploy after its first flyby of Earth. Investigators speculate that during the time that Galileo spent in storage after the Challenger disaster, the lubricants evaporated, or the system was otherwise damaged. Engineers tried thermal cycling the antenna, rotating the spacecraft up to its maximum spin rate of 10.5 rpm, and "hammering" the antenna deployment motors - turning them on and off repeatedly - over 13,000 times; all attempts failed to open the high-gain antenna. Fortunately Galileo had an additional low-gain antenna that was capable of transmitting information back to Earth, though since it transmitted a signal isotropically, the low-gain antenna's bandwidth was significantly less than the high-gain antenna's would have been; the high-gain antenna was to have transmitted at 134 kilobits per second whereas the low-gain antenna was only intended to transmit at about 8 to 16 bits per second. Galileo's low-gain antenna transmitted with a power of about 15 to 20 watts, which, by the time it reached Earth, and had been collected by one of the large aperture (70 m) DSN antennas, had a total power of about -170 dBm or 10 zeptowatts (10 × 10 watts). Through implementation of sophisticated data compression techniques, arraying of several Deep Space Network antennas and sensitivity upgrades of receivers used to listen to Galileo's signal, data throughput was increased to a maximum of 160 bits per second. The data collected on Jupiter and its moons was stored in the on board tape recorder, and transmitted back to Earth during the long apozene portion of the probe's orbit using the low-gain antenna. At the same time, measurements were made of Jupiter's magnetosphere and transmitted back to Earth. The reduction in available bandwidth reduced the total amount of data transmitted throughout the mission to about 30 gigabytes and reduced the number of pictures that were transmitted significantly; in all, only around 14,000 images were returned. 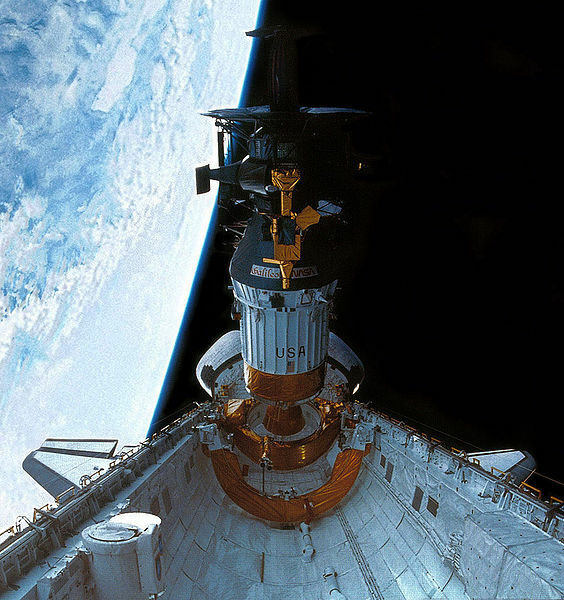 Since Galileo's high-gain antenna failed to open in 1991 the mission was forced to use the low-gain antenna for all communication to Earth. This meant that data storage to Galileo's tape recorder for later compression and playback was absolutely crucial in order to obtain any substantial information from the planned Jupiter and moon flybys. In October 1995, Galileo's 114 megabyte (914,489,344 bits), four-track digital tape recorder which was manufactured by Odetics Corporation, remained stuck in rewind mode for 15 hours before engineers learned what happened and sent commands to shut it off, after recording an image of Jupiter. Though the recorder itself was still in working order the malfunction possibly damaged a length of tape at the end of the reel. This section of tape was subsequently declared "off limits" to any future data recording and was covered with 25 more turns of tape to secure the section and reduce any further stresses, which could tear it. Because it happened only weeks before Jupiter Orbit Insertion, the anomaly prompted engineers to sacrifice data acquisition of almost all of the Io and Europa observations during Jupiter Orbit Insertion in order to focus solely on recording data sent from the Jupiter probe descent. In November 2002, after completion of the mission's only encounter of Jupiter's moon Amalthea, problems with playback of the tape recorder would again plague the spacecraft. About 10 minutes after closest approach of the flyby Galileo stopped collecting data, shut down all of its instruments, and went into "safe mode"; apparently as a result of exposure to Jupiter's extremely high radiation environment. Though most of the Amalthea data was already written to tape, it was found that the recorder refused to respond to commands telling it to play back data. Through careful analysis after weeks of troubleshooting of an identical flight spare of the recorder on the ground, it was determined that the cause of the malfunction was a reduction of light output in three infrared Optek OP133 light emitting diodes located in the drive electronics of the recorder's motor encoder wheel. The GaAs LEDs had been particularly sensitive to proton irradiation induced atomic lattice displacement defects, which greatly decreased their effective light output and caused the drive motor's electronics to falsely believe the motor encoder wheel was incorrectly positioned. Galileo's flight team then began a series of "annealing" sessions, where current was passed through the LEDs for hours at a time to heat them to a point where some of the crystalline lattice defects would be shifted back into place, thus increasing the LED's light output. After about 100 hours of annealing and playback cycles, the recorder was able to operate for up to an hour at a time. After many subsequent playback and cooling cycles, the complete transmission back to Earth of all recorded Amalthea flyby data was successful. The uniquely harsh radiation environment at Jupiter caused over 20 anomalies in addition to the incidents expanded upon above. Despite exceeding its radiation design limit by at least a factor of three, the spacecraft survived all the anomalies. Several of the science instruments suffered increased noise while within about 700,000 km of Jupiter. The quartz crystal used as the frequency reference for the radio suffered permanent frequency shifts with each Jupiter approach. A spin detector failed and the spacecraft gyro output was biased by the radiation environment. 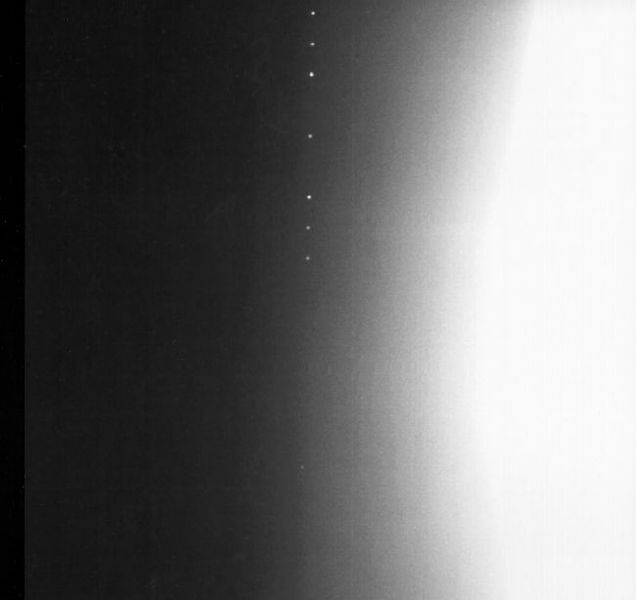 The SSI camera began producing totally white images when the spacecraft was hit by the exceptional 'Bastille Day' coronal mass ejection in 2000 and subsequently on close approaches to Jupiter. The most severe effect was a reset of the computers (called a CDS despun bus reset) that occurred when the spacecraft was either close to Jupiter or in the region of space magnetically downstream of the Earth. Work-arounds were found for all of these problems.